Home /In-Cite, Theater/Central Florida Theatre in Process In-Cite: Weekend Picks. Joan Crawford is on her way to the Parliament House Resort on Saturday. (Photo by Michael Freeman). 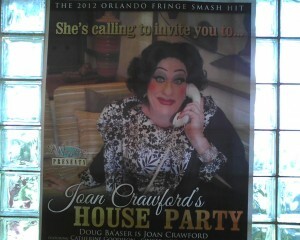 * JOAN CRAWFORD’S HOUSE PARTY is playing at the Parliament House Resort in Orlando. 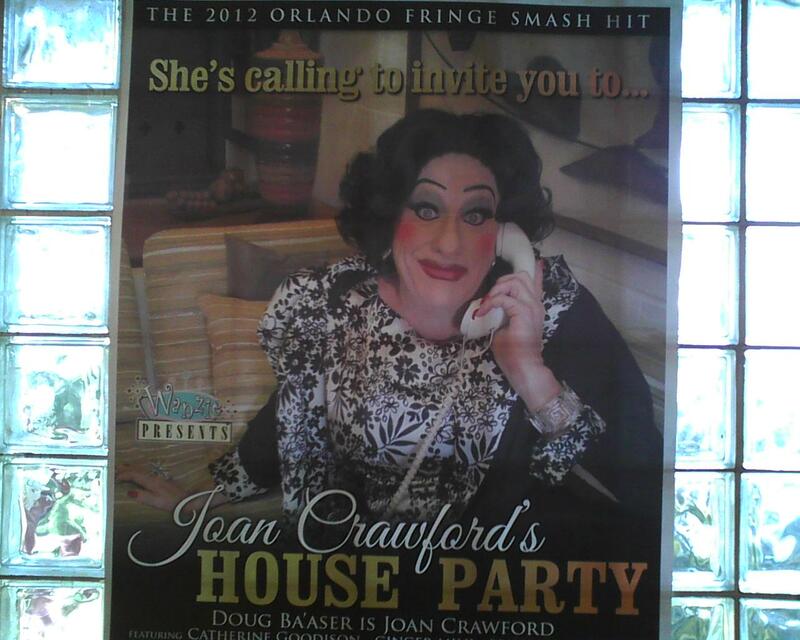 Wanzie Presents is very pleased to announce that Joan Crawford (played by Doug Ba’aser) will once again invite Orlando audiences into her lovely Brentwood home for an intimate house party being hosted with the able assistance of young Christina (Catherine Goodison) Crawford. 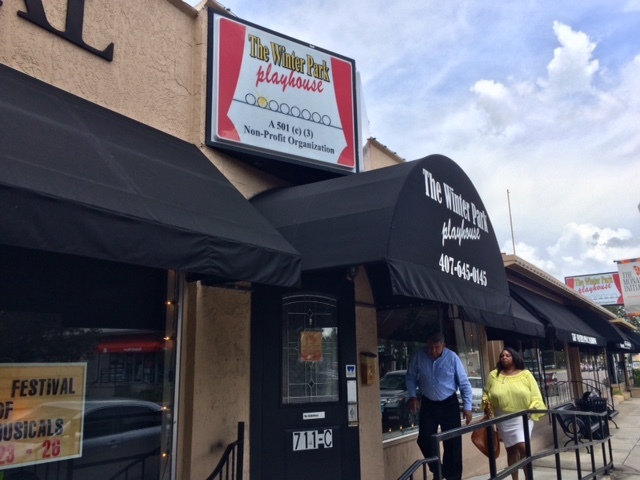 Joan and Christina and their neighbors (including one played by Josh Eads-Brown) bring the hit of the 2012 Orlando International Fringe Theatre Festival to the Footlight Theatre as the first theatrical offering of the New Year. Written by Jeff Jones, with additional material by Doug, the show was directed by Frank McClain and plays Saturdays starting Jan. 12 through Jan. 26. There will also be a show on Monday, Jan. 28 at 8 p.m. Tickets are $12 in advance, and can be ordered by logging on to www.Wanzie.com or calling 407-540-0317. Tickets are $15 at the door if available. * “Launch 2013” by the Playwrights’ Round Table runs tonight and Saturday, and Jan. 18 and 19, at 8 p.m., and with Sunday 3 p.m. matinees on Jan. 13 and 20. This will be seven short original comedies and drams by PRT member playwrights. The shows contain adult language and some sexual situations and are not recommended for children. Presented at the Santos Dantin Studio Theatre at the Orlando Shakespeare Center, tickets are $15 general admission, and $12 PRT members, students, seniors over age 65 and military with an ID. * Central Florida Community Arts will host the Kick Off of the Spring 2013 season for its CENTRAL FLORIDA COMMUNITY ORCHESTRA on Monday, Jan. 14. The Kick Off will occur from 7-9 p.m. at Howard Middle School, 800 E. Robinson St., in the Band Room) and will continue weekly, with a concert scheduled for March. No auditions are necessary. The season is open to all players, both professional and amateur, from high school through adulthood. * “Murder at Howard Johnson’s” is playing at the Shoestring Theater in Lake Helen and opens tonight through Jan. 27. The show runs evenings at 8 with Sunday matinees at 2:30 p.m. Call shoestring at 386-228-3777 for details or visit http://shoestringtheatre.net/. * ART by the Titusville Playhouse features Robert Pigott, Stephan Jones and Patrick Sullivan performing for two weekends at their more intimate Emma’s Attic space! * In the Limelight, a production company and performing arts studio for young people, is casting five productions – plays and musicals for youth grades K-12 – on Saturday, Jan. 12 by appointment. Productions are “Footloose,” “Adventures of Tom Sawyer,” “Ramona Quimby,” “Bridge to Terabithia” and “Disney’s Winnie the Pooh Kids.” Email katie@inthelimelightorlando.com for an appointment time. Auditions are at 5555 S. Kirkman Road, Suite 104/105, in Orlando. Visit www.inthelimelightorlando.com for details. * A Free Industry Workshop for adults will be on Jan. 14 from 7-10 p.m. at the Truthful Acting Studios, 5542 Hancel Ave. in Orlando. To reserve seats, email vanessa@truthfulacting.com. * There will be two opportunities to increase your acting skills at The CAST Studio. CAST stands for Commercial Actors Success Training for Adults and Teens. Programs start on Tuesday, Jan. 15 from 7-10 p.m. CAST is an intensive eight-week course for adults and teens, designed for beginners and working actors who want to increase their bookings. Each student will work ON-CAMERA every class at their level and receive individualized critique. To register, call 407-491-6037 or go to www.ShaunaBartel.com. Sheriff’s office goes high tech with new mobile APP.